Another company’s DNA results popped up on my morning email. 23 and Me. I used them to try and learn more about my father, past the tall and silent part. I knew my dad’s history basically from my mother, which was both his parents were Irish, from time immemorial. His name was John Lindsay Lytle. Dad’s mother’s people came from Cork in the time of the great mid nineteenth century famine. His father’s family was Ulstermen with deep Scottish roots. They emmigrated in the eighteenth century, and simply brought their talents over the ocean. The father of that Lytle family was a tailor and school teacher, his wife a physician. I’ve a good deal of amateur genealogical research on both sides of my family. Mom was easy to trace. Her ancestors left draft records and farms in their wake. Dad was an enigma. Not his grandfather, not his aunts and uncles, but his parents. Or, why did his father, an Orangeman through and through, marry his mother, a short, round, red headed Cork Catholic, the oldest of going on a dozen siblings, and fifteen years his junior. Five children and seven years later, the marriage fell apart. Mary had stories of moving too often, too many children, no money. George disappeared, but was discovered to be himself on his death, twenty years later, in Colorado. And the children lived lives of desperation and short rations, shuffled among relatives, in and out of the Children’s Home. Dad joined the army the week after he turned seventeen. I used to make up stories about my dad, based on his appearance. He was six and a half feet, far taller than the men from his mother’s family. He had coal black hair and brown eyes. All the other Irish men I knew from my grandmother’s family had red hair and blue eyes, and were more average height. I did meet a man from my grandfather’s side of the family, in my searches, and he was close to what I recalled as my dad’s height. I called my dad a Black Irishman, simply because he more resembled what I read of those Irish than of the rest. The Irish who descended from survivors of the wreck of the Spanish Armada, King Phillip II’s ill-fated attempt to invade England in the middle of the sixteenth century. This DNA report throws in 30% French/Spanish DNA from my father. There’s the Spanish Armada. This DNA report also puts my ancestry having more Neanderthal genes than eighty plus percent of their clients. This is a broad brush fact, but Neanderthal genes contribute height. They also contribute endocrine disorders, alcoholism, human papilloma virus cancers. My family knows all three of those, well. The 23 and Me report also says it can provide me with 1,080 first and second cousins all over the world. I am very tempted to put my money down and see if I can contact my 15 cousins in Colorado. I still have not learned why my grandfather married my grandmother. Dear Joanne, like Yamini in her comment, I find your posting fascinating. I've never really explored my ancestry except to do that "spit" test that rivaled I'm 68% Irish and then 23% English and 8% Scandinavian (I think that's the Viking invading the British Isles!!!!!) and 1% mixed. But as you write I'm thinking maybe it would be good to know more about my ancestors. I've just never done it and now I'm the oldest living of the family on both sides. So perhaps it's time. Thank for providing the impetus. Peace. Oh, yes. You're the last one who knows. "They" will be sorry when there are no answers. Fascinating. I have to tell you your father does look Spanish to me more than he does Irish. My thoughts. And, a very Roman nose. Such a wonder to learn how all traveled and connected. You discovered some real gems here. DNA searching is fun. My family is also Irish Catholic (Cork and Kerry) and they went to their graves with many secrets. They were very proud people and never wanted any of their dirty laundry to be known. Looking at your wonderful picture, I can see that you favor your dad. I bet that everything else about you comes from your strong mom..
Irish in my background as well on my fathers side. The men were all short, dark haired with green or blue eyes. I can't imagine having all those wonderful first cousins. Amazing. I have two. But, I don't know them, and didn't know until this morning that our DNA matches. They have agreed to share and I must pay to join to find out. Interesting times, eh? Fair complexion, blue eyed Irish in my family, Joanne. Those Irish sure went places! "Stranded in a tiny town, on fair Prince Edward Island..."
Not more magical than that though. My maternal grandfather was described as black Irish. He was long dead before I was born, as was my maternal grandmother. The grandfather, though very dark like your dad, was very short with a reputation of being a ladies' man. 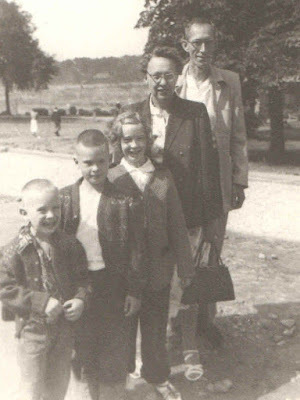 My grandmother had bright red hair and was short and round. My first thought when reading about your father was the song The Orange And The Green. An Orangeman from Ulster and a Catholic girl from County Cork. Classic. My father-in-law was 100% Irish too. We have been digging ans have found little. Irish immigrants were often too busy trying to feed their families to pass down the family histories. I wish you luck on your search. My son's 23 and me results did help a ;ot. My own results should be arriving soon. My brothers are gone, my nephew won't (like the government really cares! ), so I'm down to surmising. I think my grandfather though he could profit from this father-in-law's housing development in the most uninhabitable part of Akron. I could look over land records, some day. For complicated reasons my ancestory is pretty much a mystery to me. Something I should explore. Interesting about the Neanderthal contributions. My father's ancestry is a mystery too, my mother's is German for two generations, then Swedish beyond that, but ancient ancestry is unknown there too. I'm curious, but not enough to put down the dollars and find out. It is VERY addictive isn't it? My fathers family had a lot of secrets. I was sad to discover my grandfather lived in our neighbourhood. If we ever met him we weren't told who he was. Today I learned that my "Irish" maternal Jamiesons weren't Irish at all. My 3xgreat grandfather was Scottish. He took his family to Fermanagh, Ireland. His son brought his 7 teenage children to Canada when his wife died about 1830. He dumped the kids with a relative who had immigrated previously and took off into the wild blue yonder way to the north. When he learned that his sons had applied for land grants he came back. Oh the stories we have yet to discover! VERY addictive. My brother spent time in Colorado training, and said a local news caster was the image of our Aunt Ruth. I need to go through the my records and find my grandfather's nome de plume in Colorado. I'm sure he got around. Genealogy is very fascinating and most of us succumb to doing some research. As we get older it seems the need to know grows. Perhaps because we also might have more time when we are older. I hope you can find out everything you want to know. Good deductive reasoning on your grandfather's background. If I were you, I would plunk my money down! I always thought my father was French Canadian because of his distinctive facial features (which all his brothers shared and which came directly from his father) but the family had research done and it turned out he was directly in line from England! It turned my head upside down. I learned so much from my grandmother when she was old and lonely. One question would start a long train of memories. The same with my mother. It was good for both of us. Maybe I missed a post, but did you have the DNA testing done from more than one provider? And did you get different results from both? How does it work? My husband is 100% Irish except the part that also goes back to the Spanish Armada:-) He doesn't want to hear it about the Armada, though. Similar results. The first was my mother only, this added my dad. Ireland had so many invaders, almost as many as England. I loved the Armada from the time I heard about it, say high school. It just fit for my dad. When I had a test done by 23 a number of years ago, I got nothing but some vague report about my pre-historical folk. Anne Cleeves has a series, Shetland, in which her detective protagonist has that Spanish ancestry in northern Scotland. There's a series of novels plus a Netflix series (last I checked). I hope you are putting all this info down in a book, maybe a separate blog you can get printed. I have often thought of printing my blog out in print in case it's lost. genealogy is so interesting. my sister is the genealogist in our family. she has traced us back on one bloodline to the 900s. perhaps your parents married out of desperation. you mother maybe saw it as an escape. at least that's why I married my first husband, to escape from under my father's thumb, even though I knew I would not stay married to him. My grandparents; my dad's parents. His mother was the oldest of an unending line of siblings, which made her part of the care taking line. But there is no reason under the sun for a thirty plus year old man to marry an 18 y/o girl. It was not a shotgun wedding. Who knows. It is so much fun. I've been involved with genealogy for many years and have so many lives and stories bouncing around my head. An Orangeman marrying a Catholic does sound odd. Perhaps he knocked her up and it was a shotgun wedding? Not shotgun; my dad was born a year later. It blows me away that he abandoned five children to abject poverty. That's a hanging offense, in my book. My dad fed his siblings bread soaked in coffee for two meals a day. My dad never spoke of it; my aunts and uncles told me of their childhood and how Johnny took care of them. 23 and Me let me know that I'm just about 3% Neanderthal. Crazy stuff. I guess I may have to try 23 and me to see what they come up with. DH and I did ancestry DNA and it shows me 60% British which was no surprise since dad and his family came over to the States from England in 1920. I was hoping to know more about the Irish side since our family name was O'Regan. But after several generations in England (probably since the great famine), I imagine the Irish line diluted. But as far as an Orange man marrying a Catholic... not so strange. My dad was Church of England (not exactly an Orange man, but still a Protestant) and married my very Catholic mom. Dad was blonde with blue eyes, but 2 of our 3 children are red heads... and 3 of our 4 grandchildren too...?